Reading the book by Francis Watson, Gospel Writing (Grand Rapids, Cambridge, 2013), and working on the commentary on Marcion's Gospel (and the reconstruction of its text), especially the two passages on the healing of the leper (par. Luke 5:12-4) and the question of whether one should pay tax to the king (par. 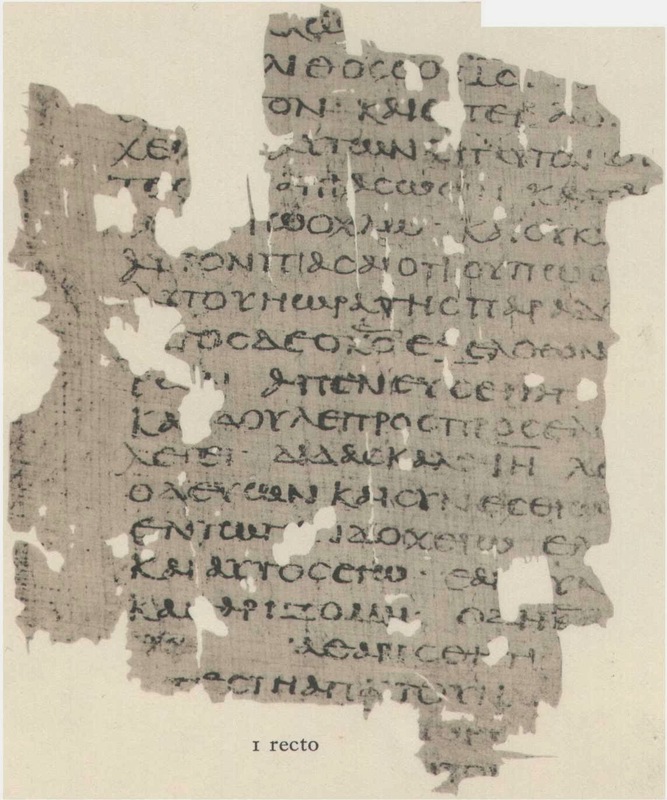 Luke 20:20-6), I noticed that the 'unknown gospel', preserved in the fragments of Papyrus Egerton 2/P. 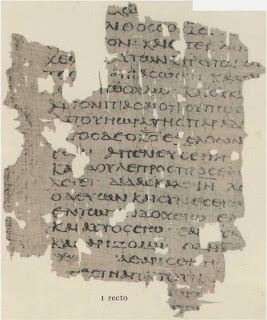 Köln 255, displays the same synoptic feature which I have found with regards to the relation between the Gospel of Peter, the canonical gospels and Marcion (see the previous post on this). Hence when Francis Watson in his mentioned study states that a ‘comparison of the Markan version with Matthew 8.1-4 and Luke 5.12-16 does not produce any significant findings in relation to GEger [= Papyrus Egerton 2/P. 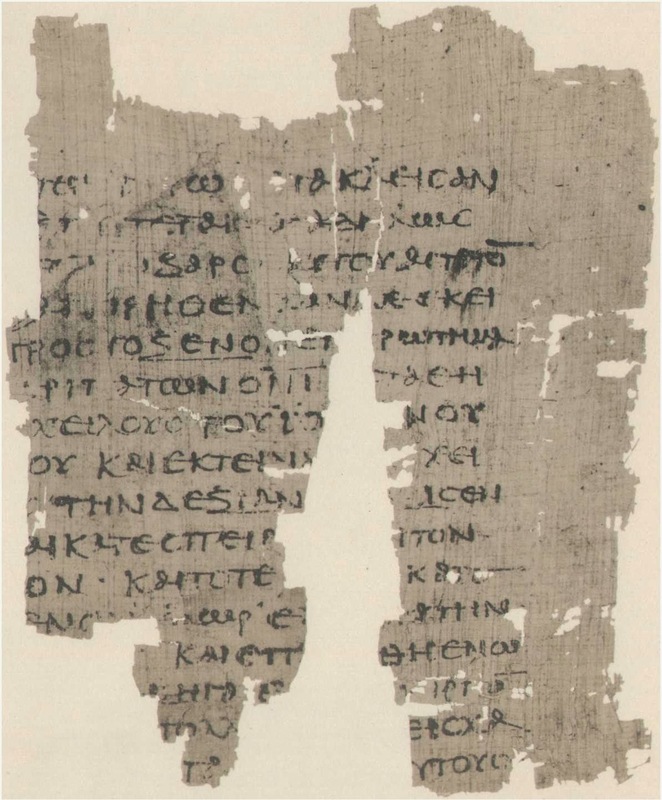 Köln 255]’, a closer look at the nature of what these papyri preserved us, indeed, sheds further light on the relation between our early Christian gospels. [...] And Jesus said to the lawyers: "Punish every wrongdoer and transgressor, and not me. [...]* he does, how does he do it?" And turning to the rulers of the people he said this word: "Search the scriptures, in which you think you have life. These are they, which testify about me. Do not suppose that I have come to accuse you to my father. There is one who accuses you: Moses, in whom you have hoped." And they said: "We know that God spoke to Moses,but as for you, we do not know, where you are from." Jesus answered and said to them: "Now is accused your disbelief in those who have been commended by him. For had you believed Moses, you would have believed me. For about me he wrote to your fathers [...]"
"Judge the deeds, how he does, what he does." "Because an outlaw does not know, how he does, what he does." "Because it's unexplained, how he does, what he does." "And see, how he does, what he does." "Who is condemning, how he does, what he does." [...] and taking up stones together to stone him. And the rulers laid their hands upon him to seize him and hand him over to the crowd. And they could not take him because the hour of his arrest had not yet come. But the Lord himself, escaping from their hands, withdrew from them. And behold, a leper coming to him, says: "Teacher Jesus, while traveling with lepers and eating together with them in the inn, I myself also became a leper. * If therefore you will, I am clean." And the Lord said to him: "I will, be clean." And immediately the leprosy left him. And Jesus said to him: "Go show yourself to the priests and offer concerning the cleansing as Moses commanded and sin no more [...]"
* (Schmidt:) You look for the lepers and were eating with publicans. Have mercy, I am like them. The original reconstruction is factually impossible (traveling with lepers), therefore this new one. Coming to him, they tested him in an exacting way, saying: "Teacher Jesus, we know that you have come from God, for what you do testifies beyond all the prophets. Therefore tell us, is it lawful to pay to kings the things which benefit their rule? Shall we pay them or not?" But Jesus, perceiving their purpose and becoming indignant said to them: "Why do you call me teacher with your mouth, not doing what I say? Well did Isaiah* prophesy concerning you, saying: 'This people honor me with their lips, but their heart is far from me. And in vain they worship me, teaching as their doctrines the precepts of men...'"
"Because these people draw near with their mouths and honor me with their lips, while their hearts are far from me, and their worship of me is a human commandment learned by rote, ..."
"(...) shut up (...) has been subjected uncertainly (...) its weight unweighted?" (Dodd:) "When a husbandman has enclosed a small seed in a secret place, so that it is invisibly buried, how does its abundance become immeasurable?" (Schmidt:) "Why is the seed enclosed in the ground, the abundance buried? Hidden for a short time, it will be immeasurable." (Cerfaux:) "(...) enclosed like me, buried, uncertain, and making possible immeasurable abundance?" (Lietzmann:) And when they where perplexed at the strange question, Jesus, as he walked, stood on the banks of the River Jordan, and stretching out his right hand, he filled it with water and sowed on the ground. And the sprinkled waterpurified(?) the ground. (...) and coming out before them, the fruit appeared. (Lagrange:) And when they where perplexed at the strange question, Jesus walked at the banks of the River Jordan, and stretching out his right hand, he filled it with sand and sowed seed on the sand. And then he poured running water over it. And it run to seed and coming out before them, the fruit appeared. A small seed in the ground is hidden and invisible. How does its abundance become immeasurable? 17:5 Then he took a seed from the land, placed it in fertile soil; a plant by abundant waters, he set it like a willow twig. 6 It sprouted and became a vine spreading out, but low; its branches turned toward him, its roots remained where it stood. So it became a vine; it brought forth branches, put forth foliage. [...] 8 it was transplanted to good soil by abundant waters, so that it might produce branches and bear fruit and become a noble vine. 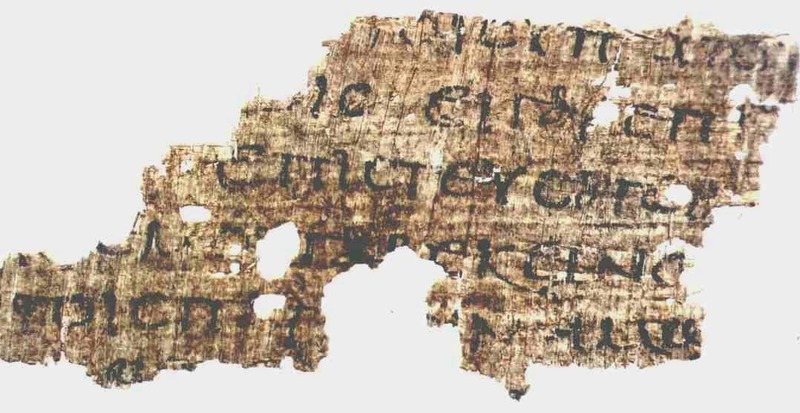 Willker does not provide a translation of the very fragmentary fragment 3 - but from the few characters it seems to follow that a parallel text to John 10:30-9 had been written down. 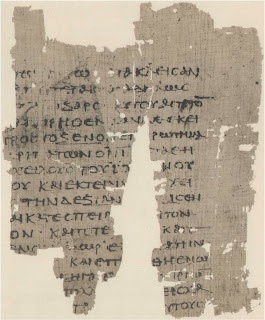 The opening text of what has been preserved of this unknown gospel (section 1 and 2 of Papyrus Egerton 2/P. Köln 255) has close parallels with John, but with none other of the canonical gospels. There are neither parallels in this section with Marcion’s Gospel. As soon as there are parallels, however, a very interesting observation can be made. Beginning with section 3 of Papyrus Egerton 2/P. 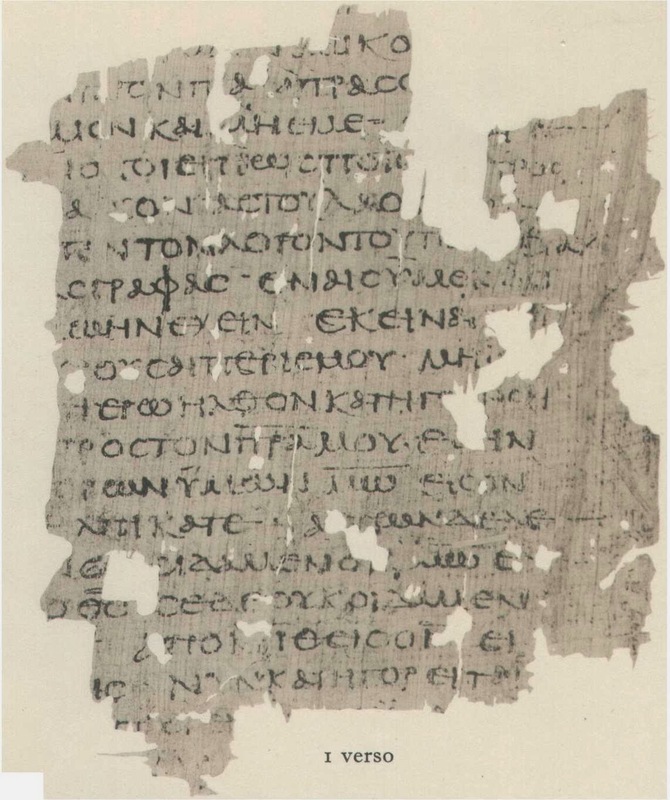 Köln 255, – and only in those texts parallel between the unknown Gospel and Marcion’s Gospel do we also find literal parallels between this unknown gospel and the Synoptics. Where Marcion’s text ends, the parallelism among the Synoptics and the unknown gospel breaks off. Similar with section 4 of Papyrus Egerton 2/P. Köln 255. 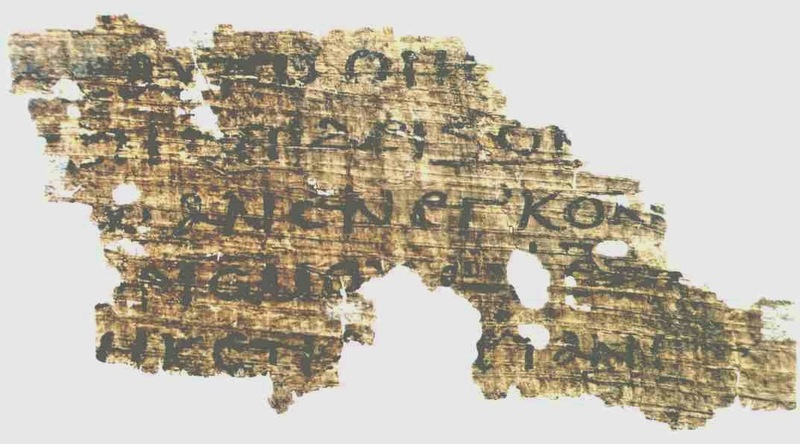 The question of the tribute money is part of Marcion’s Gospel, and again we find literal parallels between the Synoptics and the unknown gospel. Yet, the final section 5 of what is preserved has neither a parallel with Marcion nor do we find parallels with the Synoptics. 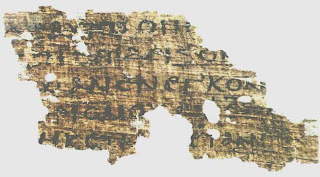 We can conclude: Very similar to what I previously have shown with regards to the Gospel of Peter it is also the case with the unknown gospel of Papyrus Egerton 2/P. 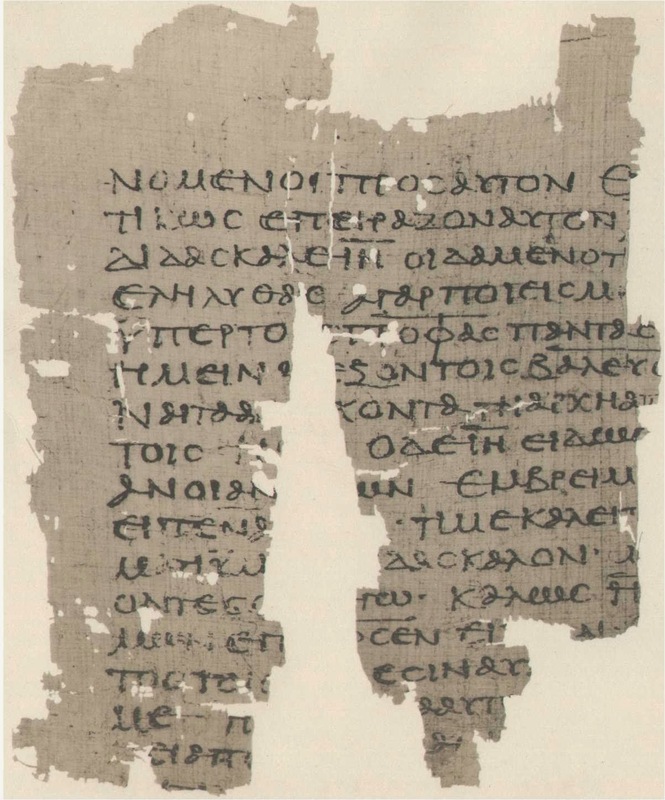 Köln 255 that the mentioned fragmentary gospels, the Synoptics (and sometimes even John) provide parallel text (often literal parallels) with each other and with Marcion’s Gospeltext, where this exists and is attested for. As soon as Marcion’s text is missing or verses declared as being absent by our early witnesses, the parallelism between the other gospels (canonical and non-canonical) stops, or is reduced to dual parallelisms (as for example between the unknown gospel and John), or we find singular traditions in any of these gospels. F. Watson, Gospel Writing (2013), 322. This makes me question why would the Egerton2 story would be presumed earlier while a tendency to strip the saying of its Sitz im Leben could be inferred? You have picked the right text - which, as you will see, will support the hypothesis that P. Egerton 2 is related to Marcion and, in this instance, a more truthful witness to Marcion than to the Synoptics. While Luke 20:20 is not attested for (hence, we don't know whether Marcion referred to the procurator), it is very interesting that Tertullian, giving us in Adv. Marc. IV 19.7 the information that 'that question about tribute money' he read in Marcion's Gospel and then quotes: 'And there came to him Pharisees, testing him'. Already Jason D. BeDuhn in his new book on The First New Testament. Marcion's Scriptural Canon (Salem, 2013), 180 notes that 'this wording is not found in any witness to Loke or any of the Synoptic parallels', and then adds: 'but cf. Papyrus Egerton 2: "And they, coming to test him, said ..."' Whether or not Luke 20:20 was missing, in Marcion we seem to have a reference to the Pharisees, not the Herodians. So, in Marcion, the saying has a Sitz im Leben, even if it is not as explicit as in the Synoptic tradition (which has the tendency to elaborate on historical details to make their text sound older and more historical than the one by Marcion), while Egerton2 has, indeed stripped the saying off. If you follow my argument - then Marcion seem to have been earlier than Egerton2 (had the Synoptics copied from Egerton2 or from an earlier tradition, Watson's hypothetical Sayings Collection, why would they not have copied the ending of the leper story by Egerton2, but broke off and went their own ways, as soon as Marcion's text had come to an end? If however, Egerton2 is relying on Marcion, the textual parallel between Marcion's Gospel and Egerton2 is explained and the wisdom character of the Apophthegma in Egerton2. As we don't have Marcion's wording of par. 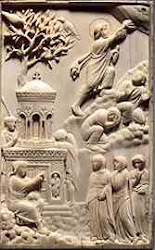 Luke 20:21-3, but only Tertullian's witness for par. Luke 20:24-5 Egerton2 may be closer to Marcion than the Synoptics, when Egerton2 states that Jesus has come from God and what he does testifies beyond all the prophets. Both, the coming from God and Jesus' action as surpassing the prophets sound Marcionite. 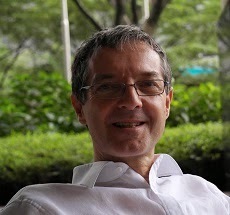 Professor Gunther Röhser (New Testament scholar in the protestant Faculty of Bonn University) has published a concise review of my earlier book on Christ's Resurrection in Early Christianity in which he states: 'this book deserves unreserved admiration and agreement not only for its overall innovative courage, but also especially for its methodological approach, its question and the many results and detailed observations.' It is also nice to read that he adds the hope that his NT colleagues would draw the consequences from their patristic colleague 'and come to a re-judgement of the Easter tradition in early Christianity' (my trans.). The review is published Theologische Revue 109 (2013): 287-9.